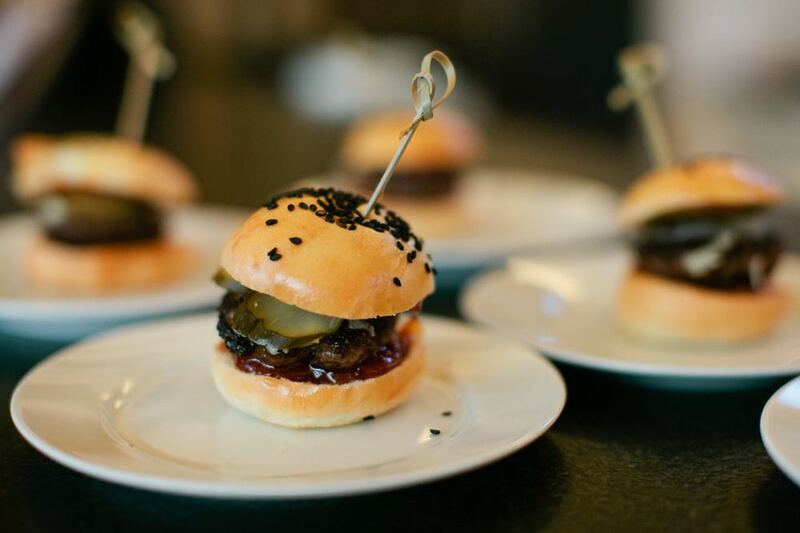 What makes a great passed hors d’oeuvre? It has to combine the right mix of flavor (salty, tangy, acidic, herbaceous, maybe just a little sweet) and texture (crunchy, chewy, crumbly, creamy) in one- maybe two- bites. It can’t be too cumbersome to eat, or fall apart in your hand. A cocktail hour is as much about catching up with friends and enjoying a drink as it is eating, after all. It’s got to be visually striking, something that calls to people from the tray, that makes guests stop a server mid stride and say “ooh, what’s that?” But they can’t be too finicky to assemble (we’ve got lots of mouths to feed and only 90 minutes to do it!) or so delicate that they topple over as soon you try to walk with them. It’s a fine balance to strike, and we spend many hours testing and tweaking recipes and presentations to get them just right. Few things say “Welcome to Maine!” like a freshly shucked oyster. Briny, creamy, slippery, maybe a little gross if you think about them too long, the oyster is certainly an acquired taste. Being able to throw one back with ease takes practice, and figuring out how you like them (Cocktail sauce? Mignonette? Just a squeeze of lemon?) takes a little experimentation. We can’t think of a better treat for the oyster lover or a better introductory taste for the uninitiated, than the beautiful bivalves from the Pemaquid Oyster Company. Grown in the cold, briny waters of the Damariscotta River in Lincoln County, the Pemaquid oysters have a clean, bright flavor and literally could not be fresher. All of the oysters at Trillium events come straight from the water to your party, and are shucked to order by the oyster farmers themselves. Guests can belly up to the bar while Smokey tells them all about the farming process, and what makes his oysters stand out. And if you’d like to really go big with the raw bar experience, we can supplement the oysters with jumbo shrimp and Port Clyde crab claws, or pair your oysters with some delicious bubbles! Pair your oysters with some white or pink bubbles! Flour, butter, eggs, sugar. Our philosophy on cakes is nothing crazy- they’ve just got to be beautiful and delicious. We love to coordinate with florists and incorporate flowers matching the wedding arrangements so that our cakes are deliciously on theme. We also offer lots of size options as well. For the traditionalist we can go great guns and deliver a 5-tier monster. Or we can do something a little smaller- 6” and 9” tiers set on a pedestal to go along with dessert bites, giving our clients an opportunity to have a cake cutting while still getting a nice variety of sweet treats. A wedding day seems to be full of first impressions- the first look, the first dance, first bite. 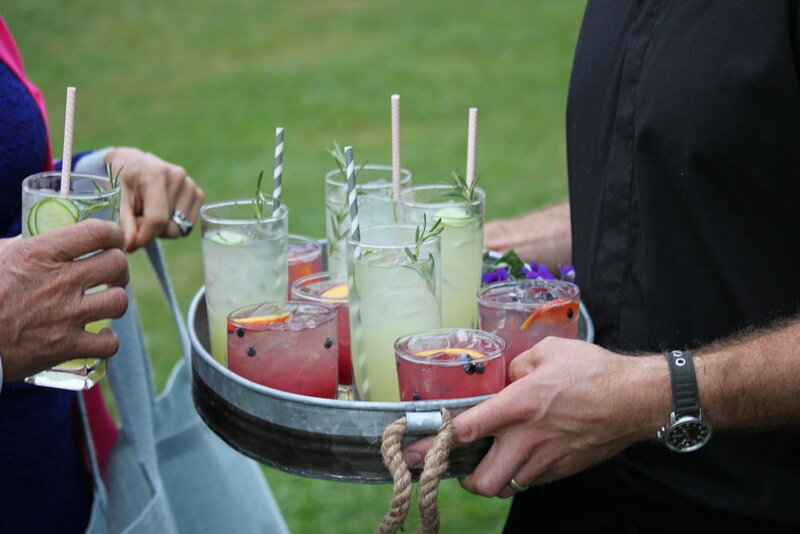 One of our favorite ways to set the right tone for the evening festivities is to greet guests with a tray full of beautiful specialty cocktails. It’s a great way to show people that we’re there to take care of them, and helps avoid lines at the bar. Plus, we love the audible “sigh” that seems to go through the whole party when everyone has that first drink in hand. Time for the party to start! It's a long day, so giving your guests the option to pace themselves is always a good idea. A refreshing non-alcoholic option is a nice touch, like our basil lemonade, cucumber mint tonic, or cold brewed iced tea sweetened with a touch of honey. We have a variety of specialty cocktail options to choose from on our menus page, and we’re always game to accommodate requests! What’s your favorite summer cocktail?